The CT-BW Analyzer&Docu module can be flexibly adapted to your company-specific analysis and documentation requirements. 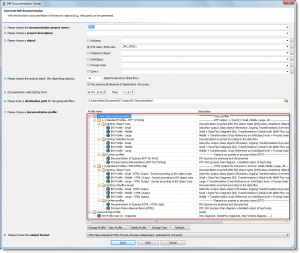 Standardized form templates ensure that BW documentation generated at different times is comparable. 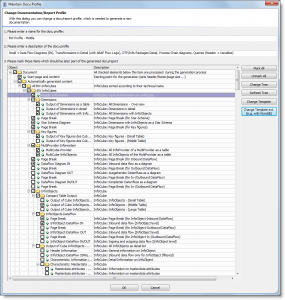 You can configure your BW documentation using more than 150 formal documentation templates. The layout of the documentation templates is in Microsoft Word® format and can be modified as required. 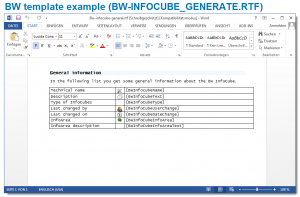 In addition, using documentation profiles, you can specify the scope of the generated BW analysis and BW documentation. Individual documentation profiles are organized hierarchically as a tree. You select the required information objects with a mouse-click. As a result of the distinction made between formal and substantial evaluation components, you can provide information to different target groups. By selecting different document profiles, for example, you can extensively document/analyze a BW data model with many technical details (target group: IT department) or with the focus “graphical data flow” and the target group: business area. The available documentation templates are used by the CT-BW Analyzer&Docu throughout for automatic generation of BW analyses. Each template refers to a single object type from the BW system. 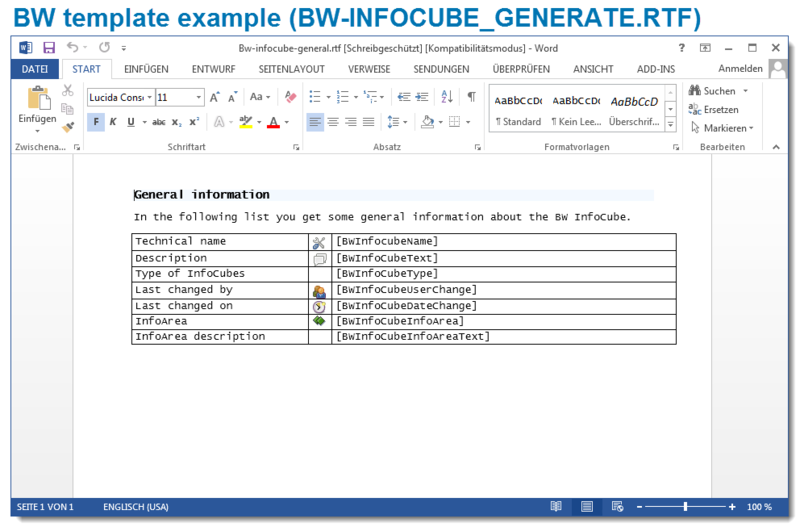 For example, there are templates for BW Query elements (formulas, selections, …) or for BW back-end objects such as InfoCubes or transformations. You can edit the templates directly in Microsoft Word®. A global Word style sheet is provided to allow you to adjust fonts and other formatting information across all available templates. 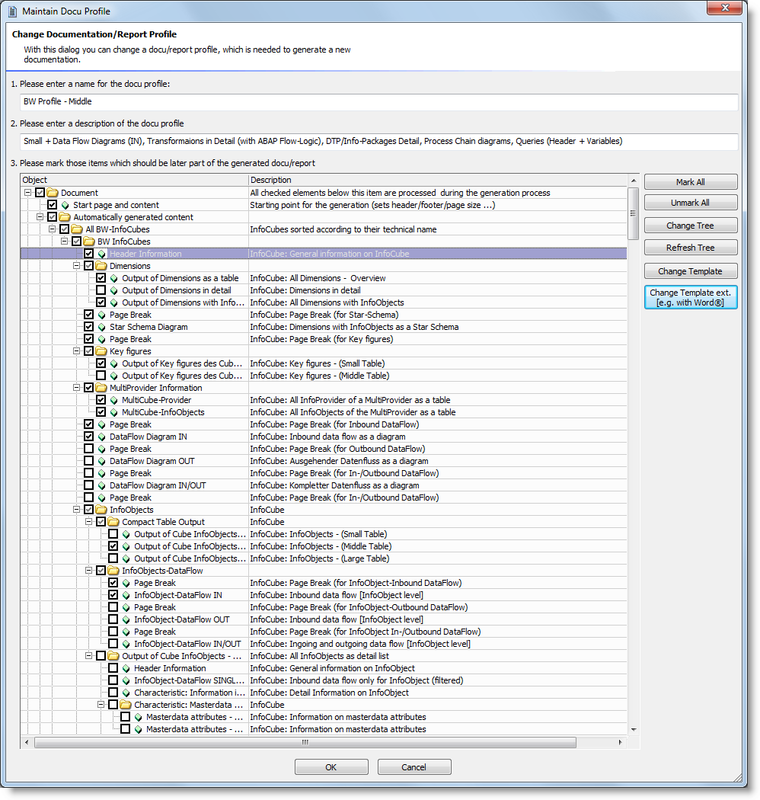 Using a selection tree, you specify the level of detail required for the analysis and the scope of the information to be output for the BW documentation in question. You can activate/deactivate individual analyses by clicking on the checkboxes in the tree. Using the profile tree, you can also directly access the individual documentation Word templates and edit these. At the start of the automatic analysis and documentation process, you can select an existing document profile from the profile pool. In addition, you need to specify the BW object volume to be analyzed. You can subsequently start the analysis/documentation of a complete BW data model or of individual BW Queries with just a few mouse-clicks. 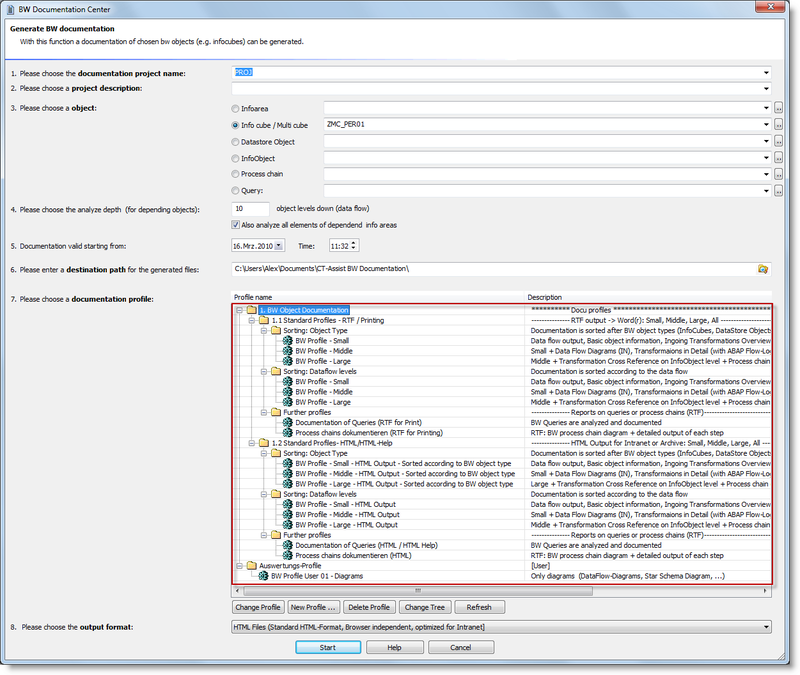 The evaluation profile with the set of selected BW objects and the documents and checklists used form part of the generated BW documentation.